I began keeping a reading journal several years before I began blogging. The following are my thoughts on a book I read in January 2005. An epic tale set in England in the 12th century during a time of unrest as the crown is in question and civil war erupts. The book opens with a man being hung for thievery and a vengeful woman cursing the men who had made the accusations: a priest, a monk and a knight. The lives of several characters are intertwined as the tale unfolds. 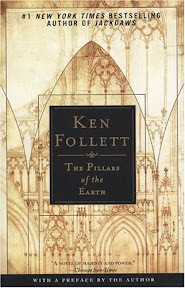 Ken Follett crafted an intriguing novel involving politics, faith, rivalry and ambition. Readers are introduced to Tom the Builder and his family, Tom being a moral and hardworking man. His dream was to build a cathedral and after suffering poverty and several losses, he finally was able to do so with the help of Prior Philip, a pious and just man. Philip was one of my favorite characters—his faith was strong and unwavering. He had a good and generous heart and strove to be just and fair throughout his life. It seemed as if every delay and obstacle was thrown in the way to stop the creation of the cathedral and yet Philip and Tom’s perseverance remained. Aliena Bartholomew was another favorite character; her strength, resilience and ability to better almost any situation she was in was admirable. The main female characters, although not always taken seriously or thought much of, were indeed strong women and not to be underestimated, even Countess Hamleigh who was usually scheming to better her own family’s end. My least favorite character by far was William Hamleigh and I actually found myself wanting to throw the book across the room as I read about his hateful deeds. He was a foul and whiny man, easily given to bad temper without any conscience or self-control. And then there is Bishop Waleran Bigod, a man who was ambitious and would do anything to move up in the world no matter who he stepped on regardless of the means he used to reach the end. I thoroughly enjoyed this novel. It came highly recommended by several people, and I just happened to have a copy. The characters were well developed and the story entrancing. I had a hard time putting down. Considering how long the book was, I was surprised I was able to read it as quickly as I did! Source: I bought this book used several years ago, probably through E-Bay, back in the days when I used to bid on entire lots of books because it was inexpensive and fun. Plus a great way to fill out a series. I read this book so long ago, while I was in England on a job. Talk about a three-dimensional experience! For this reason, I have always included this book on my top lists ever. It just made such a huge impact on me at the time. World Without End, its sequel is really good too. I read this book when World Without End was released (I simply can't read books out of order) and I, too, was surprised how quickly I read it. I have yet to tackle the second one however. It is still on the ever-growing TBR pile. Holy cow! I'm so impressed that you kept such extensive notes pre-blogging! I've never read any of Follett's work, but I know I should. I'm so glad you shared this review from your archives! I've had this book on my shelf for several years now. Clearly it deserves to be dusted off and read! I read this book about 3 years ago and was surprised at how engrossing it was. I loved it and read it in a short time, just as you did. Have you read the sequel? I really want to make the time to read that one as well. If it's half as good as the first, I will be very happy reader!! I have this book and haven't read it yet but after reading your notes from years past I know that I will truly enjoy it!! My husband read this book when he was doing research for a tv project on the Middle Ages, and said it was great. I think I'm going to steal it from him! I haven't read a Follett book in ages. Maybe it's time! This does sound good! I just bought this book! It's the second time, I lost or gave the other copy away a while ago, after not being able to get past the opening chapter, even though my whole family raved about it! So I thought I would give it another go.....and then your lovely review from 'yesteryear' convinces me I was right to get it again!! I'll certainly try reading it again. I should re-read this - I read it so long ago and remember really loving it. Thanks for the reminder! I'm glad to hear you enjoyed it too - so many people did, I'll just have to read it at some point! I have it sitting in my TBR pile, but it's huge! Not easy to carry it around. Sandy - I haven't yet read the sequel, but I'd like to. I read this one for an online book group. It's probably not one I would have picked up otherwise, so I'm glad it was the pick that month. I really would have missed out! Hannah - I hadn't read much in the way of historical fiction set in this time period before and so was a little worried I wouldn't like it. I tend to prefer more recent history. This book really made me re-assess that preference though! Molly - I thought for sure it would take me weeks to read. It really did go fast. I hope you enjoy the sequel when you get to it. Kathy - LOL It helped that it was a group read and I was the one preparing the questions. :-) My other notes of what I was reading during that time were a little less thorough. Kathleen - I hope you will like it when you get to it. I was really surprised at how much I liked it. Zibilee - It pulled me in and wouldn't let go. I love it when a book has that effect. It seems to happen less and less for me these days. Although, I think it's more me than the books. I haven't yet read the sequel, but I do want to. Dynamic Uno - I understand. I think my copy was in pretty small font too--add to that fact that it's a thick book . . . Gentle Reader - I'd be interested to know your thoughts on it. It hasn't been loved by everyone, but I liked it quite a bit. Pam - Hopefully you will enjoy it if you give it a try! Susan - My copy is old and battered (came that way when I bought it). I should probably replace it with a new copy. I know quite a few people who didn't like this one so you wouldn't be alone if you decide it isn't for you. Hopefully it will be better for you with the second try though! Clea - Revisiting my thoughts on this one has me wanting to re-read it again too. Kay - It was so good! I do hope you get a chance to read it. I read and liked this one in 2008 and think I gave it a 4 too. Now I need to read the prequel/sequel? I have this in my TBR pile and you've just made me want to start reading it now! Alice - I hope you enjoy it when you get to it, Alice!